Dividend for Starters: Why did I start this journey? It has been a great journey so far! Just 15 months ago, I did not know anything about DGI. Of course I knew about stocks, but I thought the only way to make money on the market is to know which stocks will be at a higher price tomorrow than they are today. However, I did not find myself capable enough to find such stocks. As I have learned recently, this is not because I am stupid, but because nobody in the entire world knows. Fortunately I came across DGI. This strategy enables you to make a profit without relying on rising stock prices, basically without doing anything. It opened my eyes and I really have to thank bloggers like Dividend Mantra, Captain Dividend, DivHut, DivGro and Roadmap to Retire, amongst many others for this insight! Just knowing about the strategy was not enough reason for me to start the journey. At the time I was very disappointed in all the major banks in The Netherlands. The average interest you would get at a standard savings account was 1.4% to 1.2%. With inflation taken into account, I was just losing money, instead of gaining some. My primary goal was to beat the 1.25% interest rate I received in June 2014. So, let's see what happened with the interest rate after June 2014. 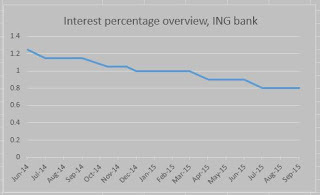 Interest rate of a standard internet savings account at the largest bank of The Netherlands. Ouch! Down 0.45% to 0.80% at this moment. What would the bank have net me in interest? In order to determine what the bank would have paid me in interest if I kept my money at the savings account, I calculated the balance of each month and added the according interest rate to it. 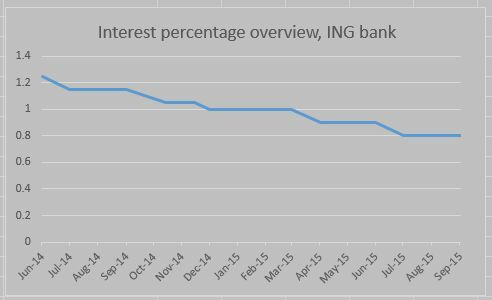 The bank would have paid me a total of €108.80 in interest over the past 14 months. Meanwhile I invested in 14 solid companies. From June 2014 to September 2015, they paid me a total of $484.04 in dividends. Unfortunately we have to deduct 15% because of tax, meaning a net total of $411.43 was received. This is the equivalent of €367.27. Kaboom! The blue chip companies I invested in, paid me 3.38 times as much as the bank would have done. Amazing.. I would not have thought that this simple strategy could be this successful. Keep at it and I'm sure you will beat your local bank as well! Wow, that's not fun! Sad story you are losing money when you put it at the bank. Are there any alternatives where you live? "only way to make money on the market is to know which stocks will be at a higher price tomorrow than they are today"
Exactly! I guess that's what most people think about stock markets, which is kind of sad. On the other hand, if all people understood the power of DGI, the stock prices would be sky high and yields would lie on the floor, probably! You are very right! People think there is so much to learn about stocks that they don't even bother. Buy low and sell high is a very easy concept that makes sense, so they just stick to that. If you do want to know everything there is no to know about the stocks and the market around stocks, I definitely understand that it could be overwhelming. Terms like write a call or a put, margin trading, going short, daytrading & forex trading.. you could do all that on the market, but if you want to know all these strategies in depth, it will take you a while! The good news however.. you don't have to. DGI is simple and effective. Happy to read that! Great progress! The beautiful thing is that power of DGI is in time. Time will bring greater and greater results.